Description: This Divya Desam is a small shrine in the innermost prakaram of the grand Ekambreswarar Temple (Kachi Ekambam Shivastalam) at Kanchipuram (shown in the image above). Deities: Nilattingal Tundattaan (Chandra Choota Perumaal) is the Moolavar in a standing posture facing west, while Ner Oruvarillaa Valli is the name of Taayaar here. Legend has it that Parvati meditated upon Shiva, in front of a Shivalingam fashioned out of earth, under a mango tree. It is believed that the mango tree withered unable to bear the scorching rays of Shiva's gaze, and that Vishnu the brother of Parvati, caused waves of nectar to rejuvenate the tree. Another legend has it that Vishnu distressed by the heat that emanated during the churning of the milky ocean meditated towards Shiva at Ekambam (Kanchi) and that the coolness of the moon adorning Shiva aleviated his discomfort; hence the name Nilaatingal tundattaan. The Temple: This is a grand temple, dedicated to Shiva, enshrining Prithivi Lingam, representing one of the five primordial elements - earth. Endowed with a vast campus with several mandapams lined with pillars with interesting sculptures, this is one of the well known temples of Tamilnadu. Please follow this link for more information on Kachi Ekambam. In a verse referring to Kachi Oorakam and Tiruvegkaa (both in Kanchipuram) Tirumangaialwar refers to Neerakam, Nilattingal Tundam, Kaarakam , Kaarvaanam and Kalva(nur). Nilattingal Tundam is a shrine in the Kanchi Ekambreswarar temple, Neerakam, Kaarakam and Kaarvaanam are shrines in the Ulagalanda Perumaal temple (Oorakam) . Kalvanoor is the name of the shrine to Vishnu (Aadi Varaha Perumaal) in the Kanchi Kamakshi Amman temple. 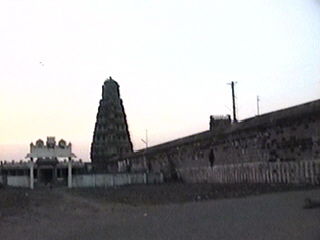 The Divya Desams revered by the Alwars in Vishnu Kanchi are Attigiri (the vast Varadaraja Perumal temple), Ashtabuyakaram, Tiruttankaa, Tiruvelukkai and Tiruvegkaa, while those in Shiva Kanchi are Tiru Oorakam (Ulagalanda Perumaal Koyil) , Tiru Neeragam, Tiruppaatakam, Nilaattingal Tundam, Tirukkaaragam, Tirukkaarvaanam, Tirukkalvanur, Tiruppavalavannam and Parameswara Vinnagaram. The vast Ekambreswarar temple(Prithvi Stalam) revered by the Tevaram hymns, is located in Periya (Shiva) Kanchi, as are the Kamakshiamman and the Kumara Kottam temples.